I really love animals and plants/gardening. I got given a bonsai as a gift in 2008, cared for it for about a year and then decided to engage in creating bonsai. 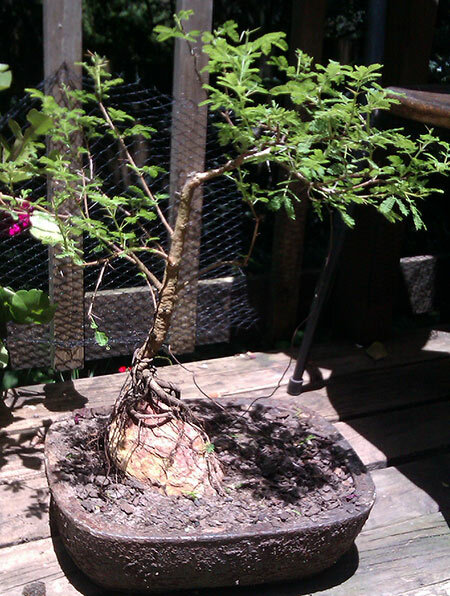 I first read up, googled, spoke to other bonsai enthusiasts, then decided to try my hand at the patient art of bonsai. The bug bit hard. The owner of a wonderful bonsai nursery in Baviaanskloof (well worth a visit, quirky tree house accommodation too) we visited in early 2009 could see I was very interested, we got talking and he kindly gave me quite a few starter bonsai plants and trees as a gift. Hence, I am unsure of the exact ages of some of the trees below, but will hazard a guess. Since then I have bought more plants and trees to bonsai and have a total of about 17 plants in the bonsai process. 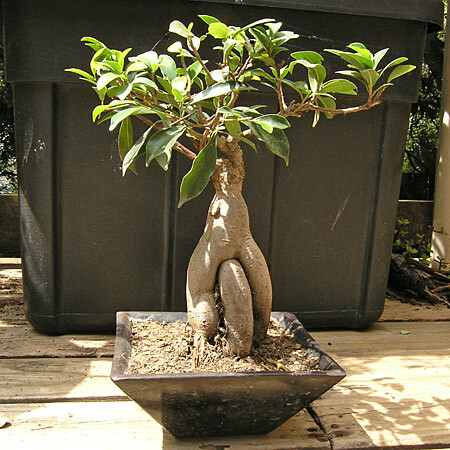 Ficus ginseng. Age: Unsure - the original gift bonsai. Received in January 2008. Monkey Thorn ( Acacia galpinii ) Age: Bought plant in January 2009. Suspect it was about 2 years old when bought. Notes: First photo: In training to have the roots over a rock. 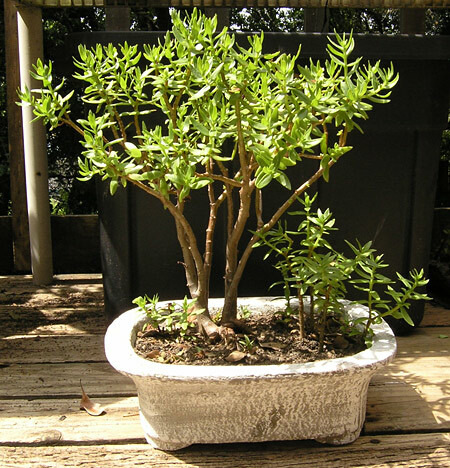 Crassula. Age: Still a youngster, about 3,5 years. Notes: Will be one large tree, with a small clump of foresting trees next to it. White Stinkwood trees. 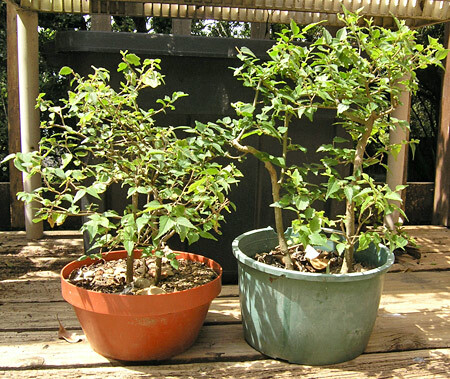 (Celtis africana) Age: Unknown, received in January 2009, suspect they were about 4 - 5 years old when received, slow growing. Notes: In training, thickening trunks and getting canopies bushy. 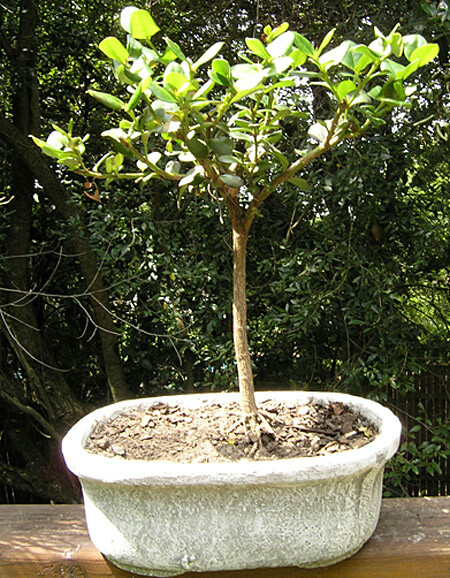 Ultimate goal - to have them all planted in one bonsai container as a stinkwood forest. Wild peach tree (Kigglaria Africana). Age: Unknown. Received in January 2009. Will wait for it to recover and grow quite a lot more before deciding which bonsai style to train it into. Indigenous plant. Has thorns. Unsure of type, will follow up. Age: 3,5 years. Notes: I will train this to show exposed roots on a rocky surface in winter 2012. 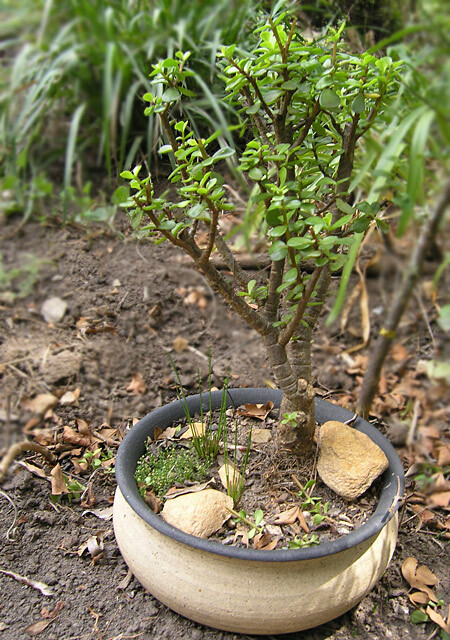 Spekboom or Elephant's foot (Portulacaria afra) has an exceptional ability to take big quantities of carbon dioxide out of the air and convert it oxygen. 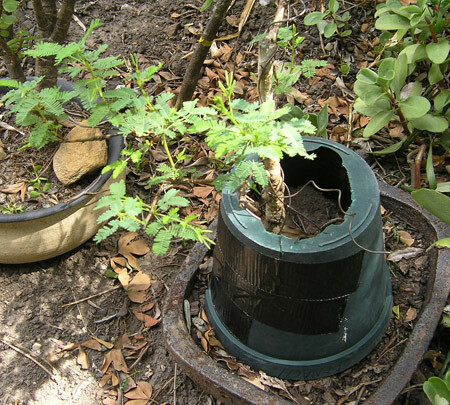 It is a highly diverse plant (read more here). Age: About 4 years. Notes: I have plenty of these in training, they grow easily from cuttings. Will have a forest of them in a container eventually. This one is the largest and I am training it into a Baobab style bonsai, which will take a while. The bottom of the trunk needs to thicken up a lot more, which is time and patience. And that's my bonsai collection for now, visit back, will keep this updated. Like this article? Comment below. Lovely! I can never grow bonsai - every time I try, my dad drowns them by watering them constantly! You have an interesting collection of lovely trees - I hope we get to see more and see them grow over time. So awesome to finally see all the trees! I love Monkey Thorns in general, but that Wild Peach is absolutely awesome!